Israel has a myriad of interesting and educational sites, all included in tours to Israel for travellers to enjoy, so choosing just a few can be difficult. Still, if one wishes to see Israel’s edifices of great architectural and historical importance, one must visit the synagogues. 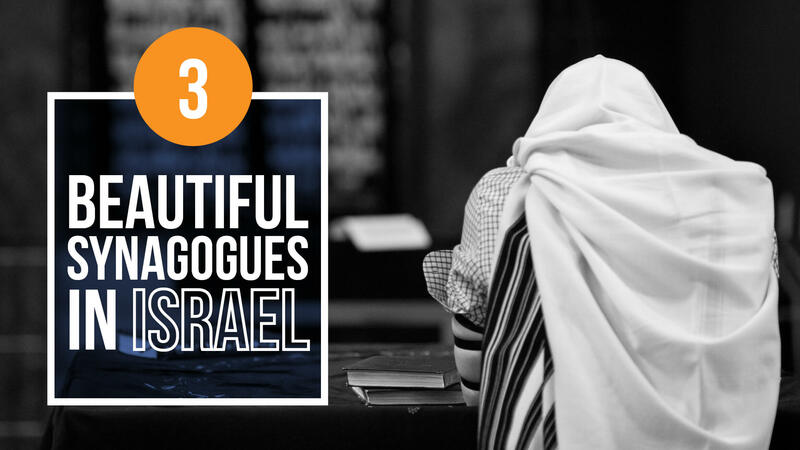 Some of the most beautiful synagogues in Israel include: Abuhav Synagogue, Hechal Yehuda Synagogue and O'hel Mo'ed Synagogue. Erected in the 16th century in Safed, Abuhav Synagogue is one of the most relevant sites in Israel to visit. It is named either after Yitzhak Abuhav, the author of Menorat Hama'or (a renowned work on ethics), or after the 15th-century Spanish rabbi of the same name who, with his disciples, established the synagogue in Safed, designing it upon Kabbalistic principles. Because the synagogue was almost obliterated in the 1837 earthquake, the southern wall, which contains the Holy Ark, remains today as the only section of the original building. As was the tradition in ancient synagogues, the bimah is placed in the centre with the benches positioned around it. The interior of the dome is craftily decorated with illustrations of four crowns, the symbols of the tribes of Israel, as well as the musical instruments that were played in the Temple in Jerusalem. The numerological tradition of Kabbalah was extremely relevant, so the design of the synagogue also carries numerical significance. For example, there is one bimah, two steps to the bimah, three Arks, and the bimah has six steps representing the six working days of the week, while the seventh at the top represents the Shabbat. The Holy Ark, made of three sections, is home to the Torah scroll written by Abuhav. The scroll is taken out to be read only three times a year, for Yom Kippur, Shavuot, and Rosh Hashanah. Another scroll safely kept there is the one written by Rabbi Solomon Ohana, a Kabbalist from Fez, Morocco, who moved to Safed in the 16th century. People have gathered in this synagogue for centuries on Shavuot to commemorate the giving of the Law at Sinai, and many visitors say that’s the best time to visit is for prayer when the synagogue is the loveliest. Completed in 1980, the Hechal Yehuda Synagogue, also known as the Recanati synagogue, was built in memory of the Jewish community of Thessaloniki, Greece that was almost annihilated during the Holocaust. That Jewish community once numbered 55,000 people, but when WWII ended, only 5000 people remained alive. Located on 13 Ben Saruk street in the centre of Tel Aviv, it is one of 500 synagogues in Israel’s capital, but this one is often called “the Seashell Synagogue” because of its shape. As a matter of fact, the design is inspired by the seashells on the shores of Thessaloniki, which is also the hometown of the synagogue architect, Yitzhak Toledano, and the Recanati family who sponsored its erection. The dome shape is important because, along with the lack of internal pillars, it enables the congregation to see and hear the service from any seat. Both the exterior and the interior of this synagogue are impressive. The concrete facade is adorned with low reliefs representing traditional Jewish motifs and symbols. The stained glass windows illustrate Jewish holidays themes. The interior contains stained glass windows, a massive ark, soft carpet, two floors, and seating that accommodates over 600 people – 400 men and 200 women. Today, the synagogue is affiliated with Greek Sephardic and Orthodox Judaism, and most worshippers at the synagogue are Greek-Sephardi Jews originating from Thessaloniki. Another impressive edifice located in Tel Aviv, and considered one of the oldest, most beautiful Jewish houses of worship, is O'hel Mo'ed, also known as the Great Sephardic Synagogue of Tel Aviv. Located on 5 Shadal St, it was completed in 1928, while its dome was added in 1932. Interestingly, the synagogue was built on dunes, using brick, and with limited resources at the time, but its architecture remains impressive and original, thanks to the combination of Art Deco and Bauhaus styles, with Oriental influences. Today, the synagogue is surrounded by tall glass buildings but, originally, gardens with almond trees could be seen in all directions, in order to respect the golden ratio, which is the harmony of proportions. The interior is equally, if not more stunning, and is infused with symbolism. The golden ratio was kept in mind for the floors, while the mesmerizing dome covers the sanctuary. After entering the synagogue through the carved doors, one can see fifteen rows that symbolise the fifteen degrees of the Old Temple. The thirty-two ornaments represent the letters of the Hebrew alphabet and its five vowels, while the dome’s base with windows symbolises the Twelve Tribes of Israel. The synagogue is still open for services, lectures, holidays, weddings, etc.